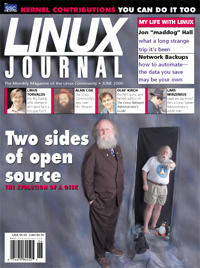 A quick look at some of the people who helped make Linux possible. Find out what's happening when using IP Masquerade and diald to access the Internet remotely. Whether it's a flesh wound or not, you'll feel much better after reading about this new cross-platform toolkit written in Python and wrapped around wxWindows. A software solution to achieve fault tolerance by capitalizing on redundant replication of data and elimination of any single point of failure and with transparent switchover. When the expense of a remote access server is no longer attractive, it's time to look at the solution offered by a VPN. In this episode, Mr. Hammel tells us about the Window Maker window manager, a less flashy but more mature product than Enlightenment. Scanning photos has never been easier. This company converted to a Linux server for its Oracle database and increased operation speeds eight-fold. In this article we are going to cover the idea of logging the system activities over a TCP network in a secure way, by interfacing the existing syslog daemon with secure shell using simple Perl scripts. To make changes in the kernel, you need to know all about the diff and patch commands. Building a web-based telephone book can be easy, as long as you don't drink too much of Marcel's wine while you work. Think Linux is only for the PC? Think again. Mr. Hammel gives us the basics for installing and configuring Window Maker.